My second game of the weekend, this time Aberystwyth itself and the Welsh Premier division. The weather was as good as the day before – August style sunshine. This double header would take a lot of beating. The new style Welsh league was trying something different this year. As well as trimming off a third of the clubs to make 12, they were having a mid-season split, like in the Scottish Premier. In February the top six teams split off to finish a mini league of their own, as did the bottom six. The winners of the bottom six section would win a place in Europe. Airbus were currently occupying that spot with Aber in second (eighth in total) and the only team able to catch them. 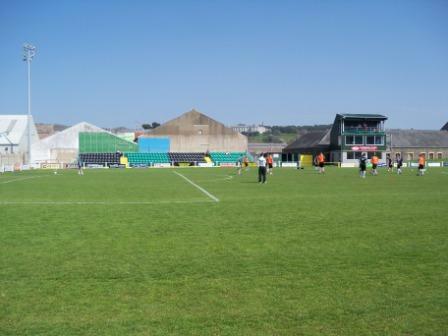 However, the winners of the bottom six would be decided by a play-off between seventh and eight; so today’s game was more of a warm up for that play-off and also to decide who would get home advantage – for the play-off to come back to Park Avenue a win today for the Seasiders was essential. 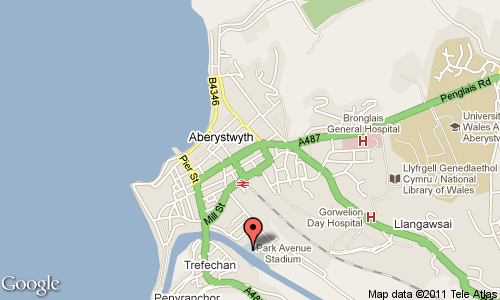 The ground lies near the centre of the town, not far from the train station and bordering the river Rheidol. For those wondering about their name, there is a river Ystwyth and Aber means mouth. 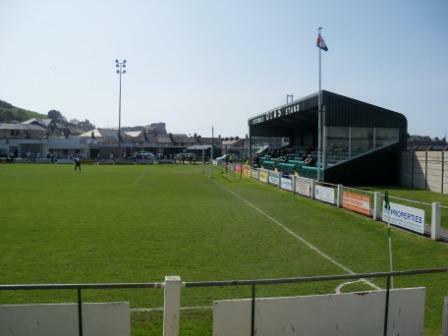 Aberystwyth Town were founded in 1884. 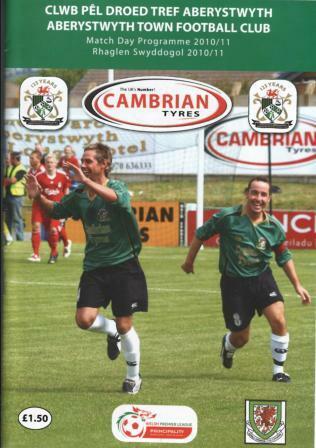 They were one of the founder members of the Welsh Premier in 1992 and are one of three teams to be ever present in its nineteen year history – along with Bangor City and Newtown. Their best finish was in its inaugural year – 1992, they finished third. They have some amusingly big record scorelines – best win 21-1 against the market town of Machynlleth in 1934 and biggest defeat 20-1 against Caersws in 1962. Their Park Avenue ground is much bigger and developed than I was expecting. It has a capacity of 5,000 with 1,002 seats. 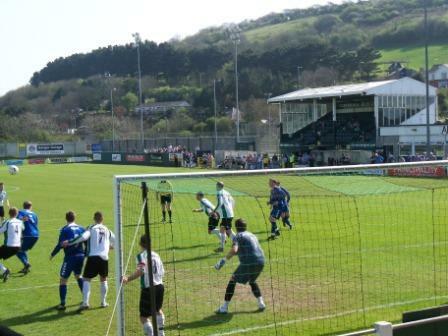 The Aber website proudly claims it to be one of the best grounds in the division, which isn’t an idle boast. It recently had 500 extra seats added to comply with UEFA ground criteria, should they qualify. 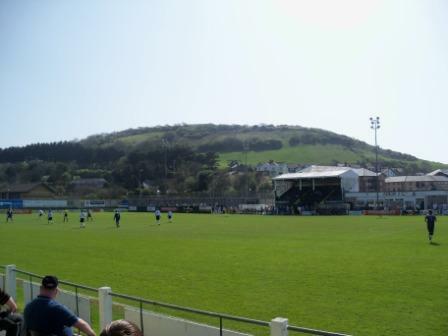 Just as well, as Aberystwyth must be the furthest town in Wales from another UEFA compliant ground – probably Newtown’s Latham Park. (43 miles. Welsh miles mind you). 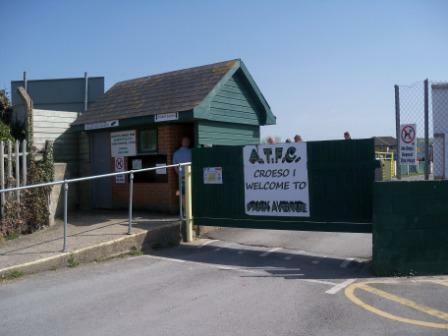 To go with the big ground, last year they had the third highest average gate in the Welsh Premier, of 391. The main stand rising steeply next to the clubhouse is a charming looking 300 seater. Viewed from the other side of the ground, you can see an eye catching verdant backdrop. Behind the goal is where most of the noise comes from, in the Dias stand. Roughly a 400 seater laid out in green seats. Down the other length were the uncovered extra seats, proving very popular in this unseasonally hot weather. However, the seats made irresistible targets for bored seagulls, so a lot were out of bounds. The seats were in blocks of alternate green and black, mirroring the famous club colours. Further along was a tall, majestic TV gantry. Behind the other goal was the only undeveloped part of Park Avenue, a sloping grass bank. Another wonderful day for football, and I spotted the same three guys who had welcomed me to Penrhyncoch the day before. Despite not being a huge deal to play for, the game was exciting and competitive. Airbus, I thought, shaded the first half very slightly, but a thunderbolt of a goal on the stroke of half time gave Aber the lead. McCarten received the ball about 30 yards out in the centre, hammered a daisy cutter straight down the middle, which veered at the last into the bottom corner, giving the keeper no chance. The second half was a similar story, but with Airbus having a man sent off for dissent. Again, a fairly even half was decided by another stunning solo effort. The ball was only half cleared from the Airbus defence to Morgan, 25 yards out, who half volleyed another screaming daisy cutter into the corner. Two great goals that Airbus, ultimately, had no answer to. Super ground, great atmosphere and hospitality for just a few pounds. 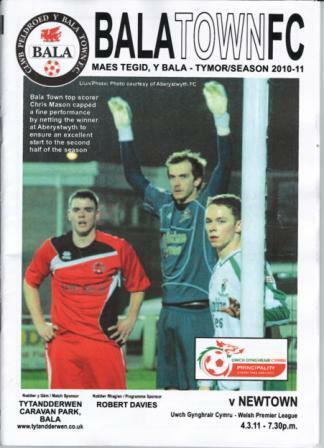 ‘No inflated ticket prices and no overpaid superstars’, was the tagline for the new ‘Super 12’ Welsh Premier – hear hear. 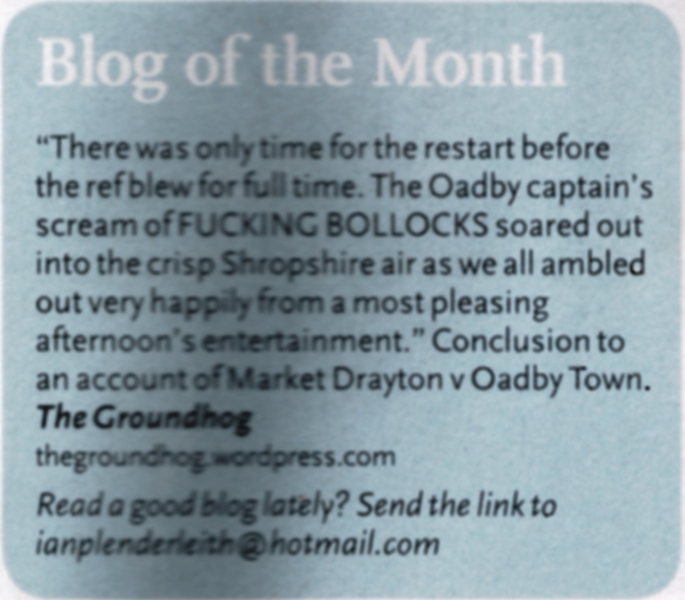 I live underground, occasionally popping up at non-league and Welsh grounds. I live on a diet of insects, small rodents, nil-nils and post and pre-match angst. 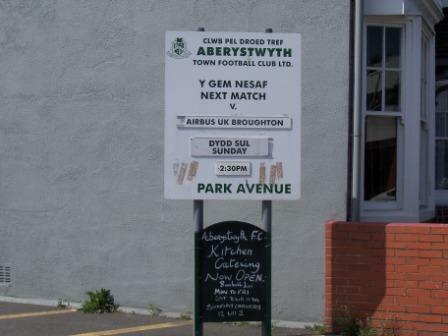 This entry was posted in Groundhopping, Travelog, Welsh football and tagged Aberystwyth Town FC, Airbus UK Broughton, Park Avenue, Welsh Premier. Bookmark the permalink. Nice report and some great photos. Weather was kind too! Thank you. Yes, it was a perfect weekend for football. I like your site so I’ve added it to my links. Sorry for taking so long to respond. You’re very welcome to use the pics, I’m happy for them to be shared round. Let me know when your post is up – I’d love to see it. Get the Google Site Translator widget and many other great free widgets at Widgetbox!